Home > Little BIG DASH from Sanitarium is back and bigger than ever! Sanitarium’s Little BIG DASH is returning to Australia for 2016, offering an exhilarating obstacle adventure which puts the fun into physical activity for more than 20,000 kids and their parents. Family teams from two to six will tackle 3km of wild and wacky obstacles to reach the finish line, forming part of Sanitarium's long-standing mission to help Australian families improve their health and wellbeing. For the first time, the event will run in three cities, returning to Brisbane and Sydney following popular events in 2015, while families in Melbourne will have their first opportunity to participate in the unique bonding experience. While Sanitarium’s aim is to encourage families to embrace an active lifestyle in a safe and non-competitive environment, participants report that the best thing about Little BIG DASH is its ability to bring people of all ages together to have fun. Brisbane will be the first city to hold the event, kicking off the laughs on 24 July at Seventh Brigade Park in Geebung, proudly supported by the Queensland Government. The fun then continues in Sydney on 21 August at Sydney International Regatta Centre in Penrith and Melbourne on 25 September at The Thunderdome in Calder Park. 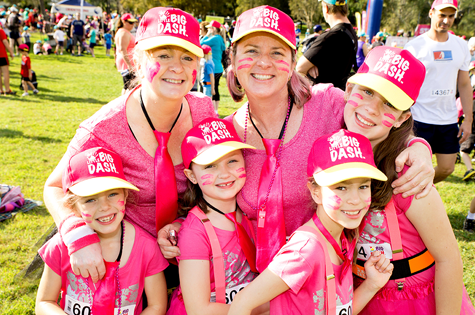 Sanitarium’s General Manager Todd Saunders commented: “We’re thrilled to bring back the Little BIG DASH from Sanitarium for another year and expand the event to reach more families than ever before. In an age where the addictive allure of screen time sees Australians living an increasing sedentary lifestyle, our aim is to get kids and adults on their feet and bring family and fitness together in the most enjoyable way possible.”Little BIG DASH from Sanitarium features unmissable activities and obstacles which have been designed for kids from age five to 15 and for adults looking to get in touch with their inner child. With ten thrilling obstacles to challenge participants, kids and parents can bounce through the Rumble Tumble Tower, twist through the Tangle Tunnel and test their balance on the Bupa Balance Beam. This year will see the big reveal of a mystery new challenge which will provide a dynamic new experience for the teams taking part. There will also be prizes for those with the best matching team outfits! Tickets for Little BIG DASH from Sanitarium are available to buy now with earlybird discounts available. For more information and to register a team, head to www.littlebigdash.com.au. Your next destination is right in your backyard!